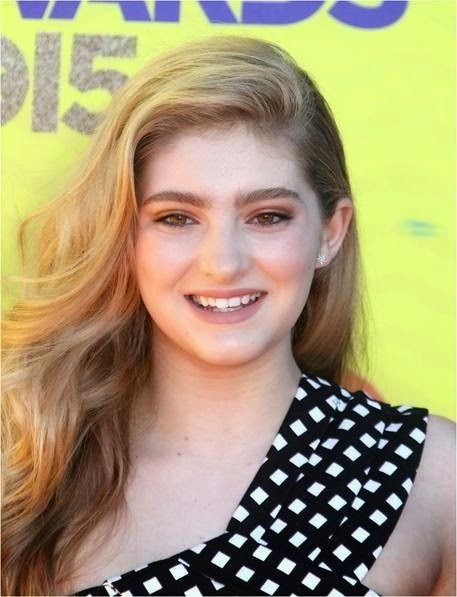 Willow Shields wore Andi Alyse and Van Balen jewelry at the 2015 Kids Choice Awards this weekend! The Dancing With The Stars' contestant stunned in a cutout jumpsuit with Andi Alyse White Gold Diamond Starburst Earrings ($550; www.andialyse.com) and a Van Balen White Gold Marquise Tanzanite Diamond Ring ($22,500; www.valvanbalen.com). Did you know that Willow has a twin sister? Yes, Autumn Shields is equally as fascinating. Shields portrayed Lisa Rogan a.k.a. Lisa Royal in a 2009 episode of the USA Network drama In Plain Sight, entitled "In My Humboldt Opinion", and the voice of a girl watching a gun fight in the 7-minute 2008 Western short film Las Vegas New Mexico 1875. In 2011, Shields appeared on CBS in the Hallmark Hall of Fame movie, Beyond the Blackboard, starring Emily VanCamp. In the television movie, Shields portrayed a homeless child named Grace. Shields starred in The Hunger Games portraying the role of Primrose Everdeen. She reprised her role in the sequel, The Hunger Games: Catching Fire. She has said that "just growing up as the character is going to be really fun". Shields will continue in her role until November 2015, when the final of four movies in The Hunger Games series is released. Shields will also star in The Wonder and A Fall From Grace. Willow is on Season 20 of Dancing with the Stars (this season).